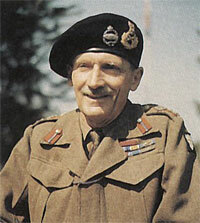 Bernard Law Montgomery was born in London, England on November 17, 1887. He graduated from the Royal Military Academy at Sandhurst in 1908 and later served in the British Army in World War I. During World War II Montgomery took over command of the Eighth Army in August of 1942. In October of that year he launched an attack on German forces at El Alamein, Egypt. The Germans, led by Field Marshal Erwin Rommel, were forced to retreat into Libya. On November 10, 1942, Montgomery was promoted to the rank of general and was knighted. Following his participation in the assaults on Sicily and Italy in 1943, Montgomery was chosen to lead the ground forces for Operation Overlord. Although believed by most to be a highly successful military commander, Montgomery was widely criticized for his attack on the French city of Caen. As voiced by Captains Miller and Hamill, many believed that Montgomery had moved too slowly and cautiously. The original plans for D-Day had called for Caen to be taken on the first day of the assault on June 6, but Montgomery's troops did not take control of the city until after it was heavily bombed on July 7. In August of 1944 Montgomery took command of the Second Army Group, which was composed of British and Canadian forces. On September 1, 1944 Montgomery was promoted to the rank of field marshall. Montgomery continued to command troops until the end of the war, and was the commander of all British troops in Germany following the German surrender in May of 1945. Montgomery died in Alton, Hampshire, England on March 24, 1976. In the film Montgomery is referred to by his popular nickname, "Monty." He is mentioned when Captain Hamill asks Captain Miller about how the invasion is going.